NEW YORK (AP) Clayton Kershaw felt strong – if not quite effective – in his return from the disabled list. That was good enough for the Los Angeles Dodgers. They had muscle to spare against the New York Mets. Kershaw and Jacob deGrom stumbled in an unexpected ace showdown, Matt Kemp hit a pinch grand slam and the Dodgers won 8-3 on Saturday night. The Dodgers have won 11 straight against the Mets dating to May 2016, matching their best run in the rivalry. Los Angeles beat New York 11 straight times in 1963-64. Kershaw gave up two runs over three innings in a surprise return from a lower back strain. He threw 55 pitches, starting out strong before laboring through his final inning. Left-handed rookie Caleb Ferguson (1-1) replaced him and escaped a couple tight situations over four scoreless innings for his first major league win. DeGrom (5-3) allowed three earned runs in six innings, including Max Muncy’s 14th home run in the first. He entered the game with a major league-leading 1.51 ERA and hadn’t allowed three earned runs in a game since April 16 against Washington. New York has lost five straight overall and 12 of 13 at home. The Mets have scored four or fewer runs in 15 straight home games dating to May 20. Some fans at Citi Field were wearing paper bags over their heads by the end of the game. ”It was tough tonight,” said Brandon Nimmo, who had three hits for New York. Kemp cleared the bases during a five-run eighth inning with his eighth career slam and 13th home run this season. Chris Taylor had a key two-run pinch double, and Los Angeles won for the 24th time in 33 games. Kershaw was scheduled to make a rehab start with Triple-A Oklahoma City at Omaha, but Los Angeles decided Friday to have him pitch in New York because of precarious weather in Nebraska. The lefty ace had been sidelined since June 1. Kershaw was electric in the first inning, freezing leadoff man Nimmo on a curveball for a three-pitch strikeout and catching Todd Frazier looking for a five-pitch K.
The three-time Cy Young Award winner wasn’t as sharp after that. Michael Conforto and Jose Bautista lined consecutive doubles in the second inning to tie it at 1, and Kershaw threw 25 pitches in the third inning, including an RBI single by Wilmer Flores to put New York ahead 2-1. Kershaw struck out four, walked one and allowed five hits before Taylor hit for him in the fourth. Kershaw was expected to be limited to roughly 60 pitches, and he threw an extra simulated inning inside after being replaced. ”The most important thing, he came out of it feeling good, feeling strong,” manager Dave Roberts said. Ferguson struck out six, walked one and allowed three hits. The 21-year-old worked out of trouble in the fifth and seventh innings. The latter jam emerged when Cody Bellinger badly misplayed Nimmo’s low liner to center, leading to a one-out triple. 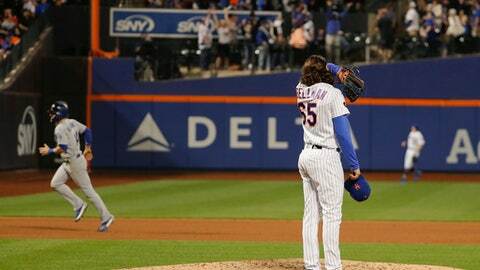 Ferguson then struck out Frazier and got Asdrubal Cabrera to ground out. Ferguson dropped his ERA from 7.59 to 5.52 in his first career relief appearance – he’d previously made three starts. Roberts said Ferguson has shown a ”good trend” of looking more comfortable with each outing. ”He’s handling himself considerably better each time out there,” Roberts said. Bautista hit a solo homer off Yimi Garcia in the eighth inning, his fourth this season. Dodgers: RHP Walker Buehler (4-1, 2.63) is still dealing with soreness from a right rib microfracture. Buehler nixed a scheduled bullpen session Saturday, and Roberts said he may throw it Sunday if there’s improvement. … LHP Adam Liberatore was optioned to Triple-A to make space for Kershaw. LHP Rich Hill (1-2, 4.99) starts the series finale for the Dodgers. Jason Vargas was supposed to start for New York, but the Mets placed him on the DL with a strained calf late Saturday night. The team expected to name a replacement starter early Sunday.